Philip Henry Sheridan was a prominent Union general during the American Civil War and a career army officer, who rose to the position of general-in-chief of the United States Army before his death in 1888. Despite his successful career, Sheridan remains a controversial figure due to his attacks on Southern civilians during the latter stages of the Civil War and his treatment of American Indians during the Indian Wars. Philip Henry Sheridan was born on March 6, 1831. He was third child of six children of John and Mary Meenagh Sheridan, immigrants from County Cavan, Ireland. Sheridan's birthplace is uncertain. Albany, New York is the most cited location, with Ireland and Boston, Massachusetts being other possibilities. When Sheridan was an infant, his family moved to Somerset, Ohio, where the elder Sheridan was employed as a road construction contractor. Sheridan was educated in the village school at Somerset and worked in several local stores before securing an appointment to the United States Military Academy in 1848. During his third year at West Point, Sheridan was suspended for a year for fighting with a classmate, William R. Terrill. Sheridan returned to the Academy a year later and graduated in 1853, thirty-fourth in his class. After graduation, Sheridan was commissioned as a brevet second lieutenant with the 1st U.S. Infantry regiment at Fort Duncan, Texas, on July 1, 1853. Later, Sheridan was reassigned to the Pacific Northwest, where he led small combat units while serving with the 4th U.S. Infantry during the Yakima War (1855–1858) and Rogue River Wars (1855–1856). On March 28, 1857, a bullet grazed Sheridan's nose during a battle with American Indians. When the American Civil War began, Sheridan was promoted to captain in May 1861, and he was assigned to the 13th U.S. Infantry, at Jefferson Barracks, Missouri, in the fall, where he served mostly in administrative roles for Major General Henry Halleck during the first year of the war. With the help of Michigan Governor Austin Blair, Sheridan received an appointment as colonel of the 2nd Michigan Cavalry on May 27, 1862, despite having no cavalry experience. Sheridan's first combat command was at the Battle of Booneville, Mississippi (July 1, 1862) where his performance prompted divisional commanders, including Brigadier General William S. Rosecrans, to recommend his promotion. In September 1862, Sheridan was promoted to brigadier general of volunteers (effective July 1, 1862). After his promotion, Sheridan was transferred to Kentucky, where he commanded the 11th Division of the Army of the Ohio during the Battle of Perryville (October 8, 1862). At the end of the year, Sheridan served at the Battle of Stones River (December 31, 1862–January 2, 1863) where his performance earned a promotion to major general of volunteers on April 10, 1863. During the summer, Sheridan's division participated in the advance against Confederate General Braxton Bragg in Major General William S. Rosecrans's Tullahoma Campaign (June 24-July 3, 1863), driving the Confederate Army of Tennessee south to Chattanooga. When Bragg abandoned Chattanooga on September 9, 1863, Rosecrans decided to pursue the Rebel army into northern Georgia. When the Confederates counterattacked at the Battle of Chickamauga (September 19–20, 1863), General James Longstreet's forces drove Sheridan's division from the field on the second day of the battle. Sheridan rallied his soldiers and prepared to support Major General George Thomas's troops, who were holding back the Confederate onslaught, but they arrived too late to prevent the Union army from being driven back to Chattanooga. With Rosecrans's army trapped inside of the city, Bragg invested Chattanooga. On September 29, Secretary of War Edwin Stanton ordered Ulysses S. Grant and 20,000 soldiers to leave Vicksburg, Mississippi to help lift the siege of Chattanooga. After nearly two months of preparations, Grant launched his breakout on November 23. At the Battle of Missionary Ridge (November 25, 1863), the Army of the Cumberland, with Sheridan's division, overran Confederate lines in a charge that exceeded the orders of commanding officers George H. Thomas and Ulysses S. Grant, liberating Chattanooga. In March 1864, Grant was promoted to lieutenant general and called to Washington, D.C. to assume command of all Union armies. Impressed by Sheridan's performance at Missionary Ridge, Grant ordered Sheridan east to take command of the Cavalry Corps of the Army of the Potomac on April 4, 1864. During the early stages of Grant's Overland Campaign, Sheridan's troopers performed the traditional cavalry role of skirmishing, protecting rear areas, and providing reconnaissance for the main army. Dissatisfied, Sheridan persuaded Grant to allow the cavalry to perform strategic raiding missions during the month of May, the fruits of which were unspectacular. As a result, Sheridan's cavalry resumed its more traditional role with the army during the summer. Sheridan's fortunes dramatically improved in the late summer of 1864. Confederate General Jubal Early invaded the Shenandoah Valley, hoping to draw soldiers away from Grant's offensive against Robert E. Lee's Army of Northern Virginia. Early's raid was so successful that his troops came within sight of Washington, D.C., causing a great deal of political concern. Forced to react, Grant created the Middle Military Division and organized the Army of the Shenandoah to deal with Early. 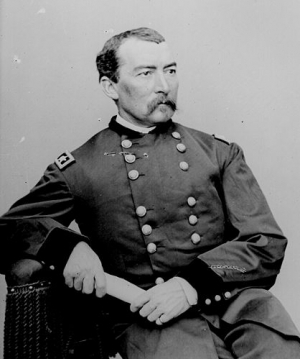 Over the objections of Secretary of War Edwin M. Stanton, on August 7, 1864, Grant assigned Philip Sheridan to command both the new division and army. After a month of preparations, Sheridan's army launched the first of several successful engagements against the Rebel forces in the Shenandoah Valley on September 19, at the Battle of Third Winchester. Following that battle, Sheridan was promoted to brigadier general of the regular army on September 20, 1864. On October 19, Early surprised Sheridan by launching a counterattack while Sheridan was returning from a meeting with Stanton in Washington. Hearing the sounds of battle in the distance, Sheridan dashed ten miles to rally his troops to victory at the Battle of Cedar Creek. The battle was a resounding Union victory that effectively ended the Confederate presence in the Shenandoah Valley and aided President Lincoln's reelection in November. Sheridan's exploits during the battle were immortalized in poem written by Thomas Buchanan Read, titled Sheridan's Ride, making Sheridan a national celebrity. After the battle, Sheridan, received a personal letter of thanks from President Lincoln and a promotion to major general in the regular army (effective November 8, 1864). Throughout the remainder of the Valley Campaign, Sheridan also warred against civilians, destroying anything in the Shenandoah Valley that might be useful to the Confederacy, including crops, livestock, and infrastructure items, such as barns, mills, factories, railroads, and communications lines. Residents of the valley referred to Sheridan's widespread destruction as "The Burning." By the spring of 1865, the Shenandoah Valley could no long provide aid or sustenance to the Confederacy. Sheridan's cavalry rejoined the Army of the Potomac in March 1865, and hastened the end of the Civil War by relentlessly pursuing the Army of Northern Virginia during the Appomattox Campaign. Sheridan's cavalry captured nearly one-fourth of Robert E. Lee's army, retreating from Petersburg, at the Battle of Sailor's (aka Sayler's) Creek (April 6, 1865). The battle was the death knell of the Army of Northern Virginia. Three days later, at Appomattox Court House, Sheridan's cavalry blocked Lee's final attempt to escape the Army of the Potomac, and the Confederate general was forced to surrender. The war did not end for Sheridan at Appomattox Court House. On May 17, Grant appointed Sheridan as commander of the Military District of the Southwest and ordered him to Texas to subdue the last remaining Confederate army under General Edmund Kirby Smith. Sheridan dutifully headed west, but Smith surrendered before Sheridan reached New Orleans. Sheridan continued on to Texas where he assembled a 50,000-man army to demonstrate against French forces stationed in Mexico. The presence of Sheridan's army, along with resistance from Mexican nationalists and political pressure from the U.S. government, induced French dictator Napoleon III to withdraw his troops from Mexico. After the Civil War, Sheridan was appointed military governor of the Fifth Military District (Texas and Louisiana) in March 1867. As military governor, Sheridan dealt with white Southerners harshly, restricting voter registration and ruling that only registered voters could serve on juries. After Sheridan removed numerous elected officials from office, including the mayor of New Orleans and the governors of Louisiana and Texas, President Andrew Johnson removed Sheridan from his assignment, over Ulysses S. Grant's objections. Grant sent Sheridan to Texas in September 1866, to subdue marauding American Indian tribes. In August 1867, Grant appointed Sheridan to command the Department of the Missouri, with orders to pacify the American Indians west of the Mississippi. Sheridan responded by attacking both soldiers and civilians as he had done during the Valley Campaign in the Civil War. During the Winter Campaign of 1868–1869, Sheridan's soldiers attacked American Indian villages, destroying food supplies and killing anyone who resisted. Sheridan also promoted hunting American bison to extinction to deprive American Indians on the Great Plains of their primary food source. Sheridan and his followers continued to use these tactics throughout the 1870s, until most of the Western tribes were subdued. Sheridan's success dealing with the Natives earned him a promotion to lieutenant general on March 4, 1869, and command of the Military Division of the Missouri, with headquarters at Chicago, Illinois. During the Franco-German War of 1870-71, Philip Sheridan visited Europe and was present as a spectator with the German forces at several battles. Upon his return, Sheridan ruled Chicago under martial law for a few days after the Great Chicago Fire in 1871. On June 3, 1875, Philip Sheridan married Irene Rucker and the couple moved to Washington, D.C. Eight years later, on November 1, 1883, Sheridan succeeded William T. Sherman as Commanding General of the U.S. Army. In 1888, Sheridan suffered a series of heart attacks. On June 1, after his first heart attack, Congress promoted Sheridan to the rank of General of the Army of the United States, the same rank earlier attained by Ulysses S. Grant and William T. Sherman. Two months later, Philip Henry Sheridan died in his vacation cottage at Nonquitt, Massachusetts on August 5, 1888, while still on active duty with the U.S. Army. He was buried in Arlington National Cemetery.